A variety of mint that is from the apple mint family of mint herbs. Pineapple Mint has green leaves with variegated ivory to yellow colored veins. When mature, this herb grows long thin shoots of pale white flowers adjacent to the mint leaves. 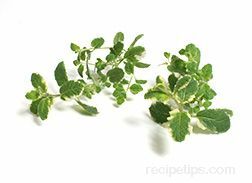 Often used as a garnish for fruit cups, fruit salads, fruit punches, beverages, and desserts, the Pineapple Mint provides a pleasant fruity flavor and aroma.